Traveloka, Southeast Asia's leading travel booking app for accommodation and flights, will be having another major sale this July 28. This one day flash sale promises huge deals on hotels and airfare and should not be missed. Traveloka follows up its hugely successful June Independence Day Pop Up Sale with the upcoming July sale. Travelers will be able to get Php1,206 off for hotel bookings in the Philippines, Japan, Taiwan, Singapore, Macau, Hong Kong, and South Korea. The same discount also applies to domestic and international flights booked that day! Bookings for the July flash sale apply to all travel dates. These deals are available for the first 1500 transactions only. With the upcoming deals, travelers get the opportunity to travel more for less when they book at Traveloka. “Travel can get expensive, and hotels and airfare adds up quickly. Through huge deals in Traveloka, we want to make travel more accessible. This gives people the freedom to travel to their favorite destinations.” added Ceballos. Unlike other booking apps, you can book both your flight and hotel on Traveloka. It’s a one-stop shop app that helps you find the best price for flights, hotels, and budget rooms where you can enjoy exclusive discounts and deals with no booking fee. All prices shown in the app include applicable taxes and surcharges. So travelers need not worry about hidden charges. Payment is also flexible for budget and leisure travelers as they can opt for offline and online methods using Visa, MasterCard, or via DragonPay, which accepts major banks like BPI, BDO, Metrobank, Chinabank, RCBC, UCPB, and Landbank. They can also pay via Coins.ph wallet or over-the-counter at 7-Eleven, M. Lhuillier, and Cebuana Lhuillier. With over 85+ airline partners and over 300,000 hotels across the world, Traveloka ensures travelers can choose the combination that’s right for them. Traveloka is available on both iOS and Android. 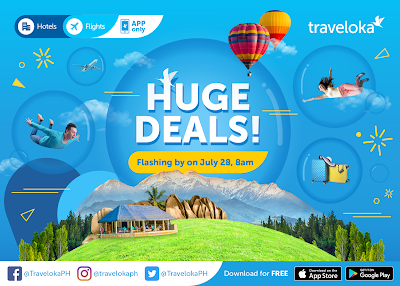 For full promo mechanics and to get the latest travel deals, please visit traveloka.com/x/pop-up-sale. Like Traveloka Philippines on Facebook www.facebook.com/TravelokaPH.